[Ed. 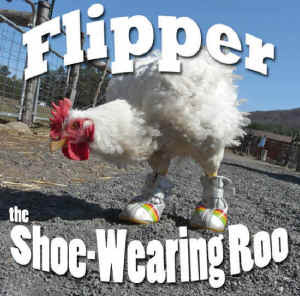 Note: Please watch 45 Days: The Life and Death of a Broiler Chicken to see how millions of "Flippers" are brutalized. Once again, the suffering of millions of animals raised to be "human food" is evidenced in the suffering of one individual...Flipper. Flipper is a “broiler” (meat breed) rooster who came to us last fall with dozens of other chickens rescued from Kapparot rituals that are held around Brooklyn during Yom Kippur. When he arrived, we noticed Flipper had trouble walking. Soon after that some of his toenails turned black, his toes followed soon after. After consulting with our vet, we came to the conclusion that, like many “broiler” chickens, Flipper had circulation problems due to his overbred, fast-growing body. As the rough winter hit, Flipper relocated to our animal infirmary where he was treated to daily foot soaks and wraps. We were amazed at how he never once seemed in pain. These treatments Flipper tolerated with utmost patience, and soon he became very friendly from all the handling. Sadly, despite all efforts, his condition continued to deteriorate and eventually Flipper’s toes became necrotic and fell off, leaving shorts nubs in their place. After a while, it was clear that Flipper wanted to leave his pen at the infirmary, but it was still too cold for him to rejoin the flock. Instead, our caretakers started allowing him out to bop about the infirmary. We thought he’d need some time to adjust to walking without the his toes. However, besides occasionally tipping forward, Flipper did pretty well! To steady and protect his feet, we tried out a pair of dog boots which seemed to do the trick and improved his balance greatly. Now, with the recent warm weather, Flipper is allowed outside.